Bedmi puri is a popular street food of North India. It is also a festive delicacy! We make bedmi puri on Diwali, Holi, Karva chauth and Ahoi ashtami. It is also called as Bedmi kachori or urad dal ki kachori. The basic ingredients to make Bedmi puri are wheat flour and little semolina (suji) which adds a nice, crunchy texture to these puris. 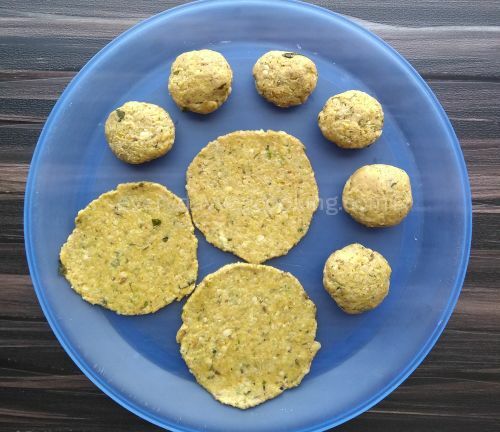 The mixture is kneaded with urad dal ki pithi along with some specific spices and condiments which enhance the taste as well as infuse mild aroma and give a special flavour to Bedmi puris. 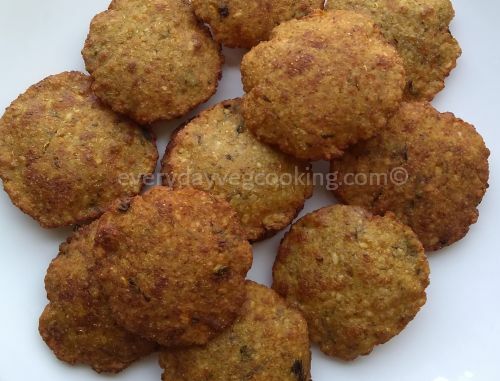 Few of my friends avoid eating Bedmi puris because urad dal (black gram dal) is difficult to digest but the addition of a few digestive spices such as fenugreek seeds (dana meethi), carom seeds (ajwain), cumin seeds (jeera), fennel seed(saunf), asafoetida (hing) and ginger makes this dish easily digestible. Authentic fluffy and crispy Bedmi puris are perfect for breakfast, brunch, lunch or dinner. Aam aur kabuli chana ka achaar. Sufficient refined oil for frying..
Soak urad dal and dana methi in sufficient water for 3 to 4 hours. Drain water and put urad dal into a mixer jar. 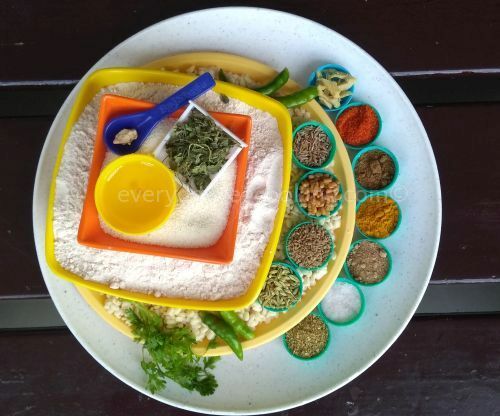 Add saunf, dana methi, ajwain, jeera, hing, ginger, green chilli, fresh coriander leaves, lal mirch powder, dhania powder, amchoor powder, haldi and garam masala powder. Now grind this mixture into a coarse paste without adding water. Take wheat flour and semolina in a deep plate, add salt, kasuri methi and 2 tbsp oil; combine this mixture properly. Now add the coarse urad dal paste and mix properly. Add water as required and knead the flour into semi tight smooth dough. Brush little oil on the dough, cover the container and keep aside for 10 minutes. Again, knead the dough with the greased hands and divide the dough into equal portions and make small lemon sized balls. Roll each ball into 3 to 4” diameter. Heat sufficient oil in a heavy bottom kadhai (wok). To check the hotness of oil, put one small ball of dough in it. if it comes up immediately, oil is ready to fry puris. Now deep fry puris on the medium flame from both sides until they are golden and crispy. Drain puris on absorbent paper. Bedmi puris are ready to serve. Relish hot-hot, crispy and fluffy Bedmi puris with your favourite accompaniment. Bedmi Puris are ready to serve! Awesome taste. Your recipes are simply delicious.